There is extensive evidence that moderate daily consumption of dairy, as part of a balanced diet, is beneficial to health. Dairy foods are excellent sources of the nutrients calcium, vitamin D (in fortified products), magnesium, potassium, protein and carbohydrates. The carbohydrate lactose is of key importance in animal life as it is the main source of energy from milk. Milk from different animals vary in its lactose concentration, with human milk having the highest lactose content while cow’s milk contains a notably lower concentration. The enzyme lactase is needed to hydrolyze lactose to glucose and galactose for absorption across the intestinal mucosa. 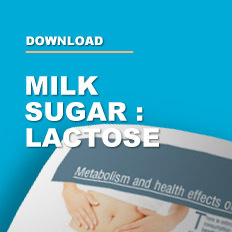 Full-term newborn infants generally have sufficient lactase activity to digest milk. However, b-galactosidase activity declines after weaning in most humans (a condition termed lactase non-persistence), especially those from East Asian and African heritage. A low lactose load (<6 g present in half a serving of milk) is unlikely to cause symptoms, even in lactose-intolerant persons. Using small amounts of dairy at a time, or taking milk with a meal, slows the release of lactose into the small intestine, which reduces the load to be digested. Less discomfort is subsequently experienced. Dairy foods such as hard cheeses, active-culture yoghurt and fermented products such as buttermilk contain limited lactose and can be eaten without causing gastrointestinal discomfort. These foods are fermented by lactic acid bacteria, which convert some of the lactose to lactic acid during production. Although more expensive, reduced-lactose or lactose-free milk is also available. 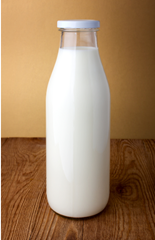 This milk has many health benefits over dairy substitutes such as soy milk. Taking a lactase tablet with milk improves digestion. Tolerance can be built up gradually over a period of time. Consuming lactose-containing foods encourages an intestinal flora population with active lactase. This can improve the ability of the bacteria in the gut to break down lactose and so gradually increase tolerance of lactose-containing foods. Chocolate milk is better tolerated than white (possibly owing to a higher osmolality or energy content). Probiotics that include lactase-containing organisms can help to relieve symptoms. The recent emphasis on the human microbiome has focused attention on the potential role of probiotics and prebiotics in promoting human health. Prebiotics are non-digestible compounds that stimulate the growth and activity of bacteria in the digestive system. Lactose and oligosaccharides in milk are considered to be bioactive ingredients that may create a healthy microbiota owing to their bifidogenic effects. In persons with lactase non-persistence, lactose is not fully digested and thus proceeds to the colon where it has prebiotic effect. In lactase-persistent persons, most lactose will be digested in the small intestine, although some may reach the large intestine. According to Venema (2012), the colonic microbiota hydrolyze and ferment lactose, producing metabolites such as short-chain fatty acids (primarily acetate, propionate and butyrate) that provide a source of energy to the microbiota and colonocytes. They can also be absorbed into the portal circulation and transported to the liver, where they may have beneficial systemic effects. In particular, dairy prebiotics and probiotics may influence gut microbiota in such a way that insulin sensitivity and the action of glucagon-like peptide (GLP-1) are positively affected. Kwak et al (2012) suggest that lactose may enhance the production of short-chain fatty acids and other organic acids that promote the growth of lactic acid bacteria and enhance the absorption of calcium. The role of dairy (and its lactose content) in health and disease is an area of growing interest. Although various components in milk have been reported to potentially be responsible for health properties, nutrients and foods are habitually eaten in combination, which makes it difficult to determine the component responsible for a specific observed effect. Furthermore, a combination of components may have an effect that would not be visible in isolation. It is thus probable that the role of lactose in health outcomes may be related to other compounds in dairy, its fermentation, and to the habitual diet and lifestyle of study participants. A number of systematic reviews and meta-analyses have shown that increased dairy consumption may protect against weight gain and obesity. The meta-analysis of 14 RCTs (883 participants) of Abargouei showed that including dairy products in weight-loss diets reduced fat mass and waist circumference and accelerated weight reduction, while increasing lean mass significantly more than conventional weight-loss diets. Dairy may significantly reduce the risk of type 2 diabetes and associated cardiovascular disease. In a meta-analysis of 17 prospective cohort and case–control studies, Aune et al (2013) reported a significant inverse association between intakes of dairy products, low-fat dairy products and cheese and the risk of type 2 diabetes. The meta-analysis of Gao et al. (2013) included 14 studies to clarify the dose–response association of dairy intake and the risk of type 2 diabetes. They found an inverse linear association of consumption of all dairy products (13 studies), low-fat dairy products (8 studies), cheese (7 studies) and yoghurt (7 studies) and the risk of type 2 diabetes. The benefits of a diet rich in fruit, vegetables and low-fat dairy, coupled with reduced total and saturated-fat intake, have also been demonstrated in the Dietary Approaches to Stop Hypertension (DASH) trial (Appel LJ, 1997), with about 50% of the reduction in blood pressure associated with the DASH diet ascribed to dairy consumption. Soedamah-Muthu et al (2012) performed a dose–response meta-analysis of prospective cohort studies in which they evaluated dairy intake and the risk of hypertension in 57 256 subjects (of whom 15 367 were hypertensive) and who were followed up for between two and 15 years. In their analysis, intakes of total dairy, low-fat dairy and milk were all linearly associated with a lower risk of hypertension. 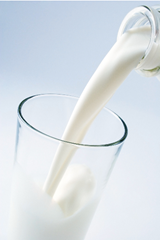 The association between dairy intake and cancer remains unclear. The complex etiology of cancer makes it difficult to prove the effect of a single food or nutrient in the development of cancer. Dairy does, however, contain compounds that might exhibit anti-cancer effects. The beneficial or adverse effects of milk and dairy foods have mostly been investigated in relation to ovarian, breast, bladder and colorectal cancers. The importance of oral health in preventing the development of caries cannot be emphasized enough. In addition, different foods can affect oral pH, plaque formation and salivary flow. Healthy eating has a critical role in the growth, development and maintenance of oral tissues throughout life. The intake of milk and dairy products is an essential component of healthy eating. It contains proteins, fats, vitamins and minerals (calcium and phosphorus), which are known to protect against dental caries. When replacing other sugars, such as sucrose and fructose, lactose has been shown to be the least cariogenic of all dietary sugars. 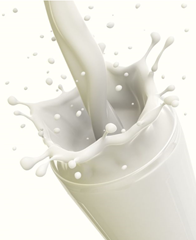 Milk further also does not increase plaque acidity. Therefore, the calcium and bioactive components in dairy may have an important role in preventing dental caries and periodontitis. Although various components in milk have been reported to potentially be responsible for health properties, nutrients and foods are habitually eaten in combination, which makes it difficult to determine the component responsible for a specific observed effect. Furthermore, a combination of components may have an effect that would not be visible in isolation. Of all the bioactive components in milk, it is primarily calcium and vitamin D that have been studied for their effects on body weight and fat mass. A high calcium intake may lead to the calcium-mediated formation of insoluble soaps, which prevent fat absorption by binding bile acids. Other milk components that may also have a favourable effect on body weight include dairy proteins (both casein and whey protein) that have been suggested to decrease visceral fat mass and body weight. Whey seems to have an important role in muscle sparing and lipid metabolism. In addition, reduced lipogenesis and increased lipolysis may explain the favourable impact of dairy on weight and fat mass. The prebiotic function of lactose may impact on body weight and subsequently also on the comorbidities associated with overweight and obesity. Although not directly related to lactose as a prebiotic, animal studies have shown that prebiotics (fructans) lead to reduced body-weight gain and fat deposition, and protect against hepatic steatohepatitis in obese and Type 2 diabetes rats. Prebiotic-mediated fermentation enhances the production of short-chain fatty acids, which, in turn, stimulate the release of intestinal hormones that influence hypothalamic neuronal activity involved in hormone-based satiety and appetite regulation. Prebiotics may further influence the bacterial composition of the gut microbiota, influencing energy homeostasis and insulin sensitivity as well as fat storage and metabolism. Hirahatake et al (2014) have also highlighted the role of the incretin hormones GLP-1 and gastric inhibitory polypeptide (GIP), both of which are affected in type 2 diabetes, in maintaining glucose homeostasis. Dairy (especially lactose) may have beneficial effects on the gut microbiota, which may affect GLP-1 and GIP. A beneficial effect of dairy on metabolic and inflammation markers relevant to type 2 diabetes and insulin resistance has been found in animal studies. Components in milk that may be beneficial in reducing risk of diabetes include calcium, vitamin D and dairy fat, with specific reference to trans-palmitoleic acid. Trans-palmitoleic acid may improve insulin secretion, triglyceridemia and blood pressure. Dairy products are low in sodium and rich in protein, minerals (calcium, magnesium, potassium and phosphorus), vitamins (riboflavin, folate, and vitamin D in fortified milk) and trace elements (iodine, selenium and zinc), which may contribute to a reduction in blood pressure individually or in combination. The association between dairy intake and blood pressure is stronger than the association between calcium intake and blood pressure, suggesting that other components in dairy products also contribute to this association. Although sodium is the mineral with the most significant effect on blood pressure, calcium and potassium also play a role. Bioactive milk peptides such as lactotripeptides may also contribute to the protective effect of dairy on blood pressure. These compounds are hypothesised to inhibit the action of angiotensin 1-converting enzyme (ACE), thereby preventing blood vessel constriction. Galactose is crucial in human metabolism, with an established role in energy delivery and galactosylation of complex molecules. 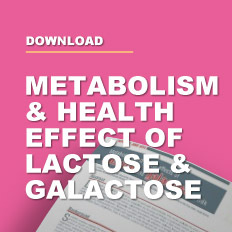 Galactose not only derived from lactose-containing food sources, but is also found in food items such as soy flour, dried figs, mamal milk, yoghurt and legumes (in descending order, containing >100 mg galactose/100 g). 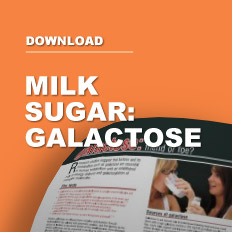 As galactose is a precursor to glucose production, it is an essential source of energy. This is particularly important during the early developmental stages of mammalian infants, when they are exclusively dependent on milk. Galactose has different functional and structural roles from glucose. Apart from its importance for energy production, the Leloir pathway is crucial for the glycosylation of complex molecules such as myelin, in which galactocerebroside is the predominant glycolipid. Galactose is therefore often referred to as ‘brain sugar’ in lay terms owing to its role in supporting brain structure and development during the neonatal period and early life . Galactose also serves as a substrate for cerebrosides, gangliosides and mucoproteins in the brain and nervous system, which lends further support to its neural and immunological role. Galactose has recently been reported to be beneficial in the management of a number of diseases, particularly those affecting brain function. The conversion of galactose to amino acids in the brain requires ammonia equivalents as substrate. This points to the potential use of galactose for removing these neurotoxic compounds from the brain in patients suffering from hepatic encephalopathy or Alzheimer’s disease. Dementia as seen in sporadic Alzheimer’s disease is associated with dysfunction of the insulin-receptor system, followed by decreased glucose transport to and subsequent metabolism in brain cells. As galactose is transported to the brain by an insulin-independent GLUT3 transporter, it can act as an alternative source of energy owing to its metabolism to glucose via the Leloir pathway. Daily oral galactose administration has also been shown to be a promising new, nontoxic therapy for the treatment of resistant nephrotic syndrome. Galactose also has an important role in maintaining a healthy gastrointestinal tract. Galactose is present in a series of oligosaccharides known as the raffinose-family oligosaccharides or galactose-containing oligosaccharides. These prebiotic oligosaccharides have been shown to stimulate growth of some intestinal microflora and also display anti-adhesive activity. Galactose-containing oligosaccharides have been shown to inhibit infections by enteric pathogens directly through the ability to mimic the pathogen binding sites that coat the surface of gastrointestinal epithelial cells. Dietary restriction of galactose resolves the symptoms of galactosemia, but is associated with severe long-term complications, such as cognitive and fertility impairments, even in patients who follow a galactose-restricted diet rigorously. This lends further support to the critical structural and functional roles of galactose in the human body. Scientific evidence confirms that lactose and its metabolites (such as galactose) are unlikely to be detrimental to health. Differential effects of various sugars on health outcomes indicate that lactose, which is naturally present in milk and dairy products, should not be targeted in attempt to reduce dietary sugar intake. Milk and milk product intake is associated with better dietary quality and has been associated with a reduced risk of overweight and chronic conditions. As shown in this review, there is extensive evidence that moderate daily consumption of dairy, as part of a balanced diet, is beneficial to health.